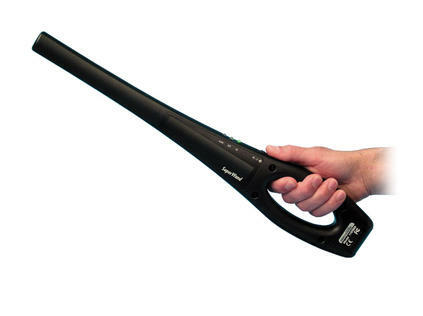 The SuperWand Hand-Held Metal Detector's exclusive 360° Plus detection field provides uniform sensitivity 360° along the scan area and pinpointing at the tip to detect metal objects with extreme accuracy. The unit provides optimum sensitivity with automatic retuning, requiring no adjustment. Alarm signals are selected by the user - audible sound or silent vibration with LED display. The three-color LED lights provide instant operating-mode information. The SuperWand's ergonomic grip and sleek dimensions make handling comfortable and less tiring. The unit operates on either a 9V battery or an optional rechargeable battery, sold separately.